There are three levels of certification. 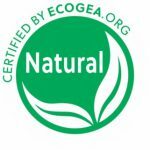 Specific conditions have to be met for a product to be included in one of three categories: natural, natural-organic (natural with organic portion) and organic. Composition of each product is checked in details during certification process. Water is considered as being a natural-mineral ingredient and as such it cannot be calculated as organic. Only physically processed and chemically processed natural ingredients from agricultural source can be certified organic. To be considered as organic or with organic content each ingredient must be certified at accredited certification body. Ingredients from agricultural source are any plant, animal or microbial product derived from agriculture, aquaculture or is collected/harvested in wild. Minimum 75 % of natural ingredients required. No minimum organic % of processed natural ingredients from agricultural source (physically and/or chemically) is required, but is highly recommended. Minimum 85 % of natural ingredients required. Minimum 95 % of natural ingredients required.